I did it! I Ran my first 5k! January 29th, 2011 is a day that will live in infamy. Well, maybe only for me. I ran my first 5k in 40:09. Amazing. A little over a year ago, if someone had told me I would RUN a 5k, I would have laughed. Me? Run? No way! 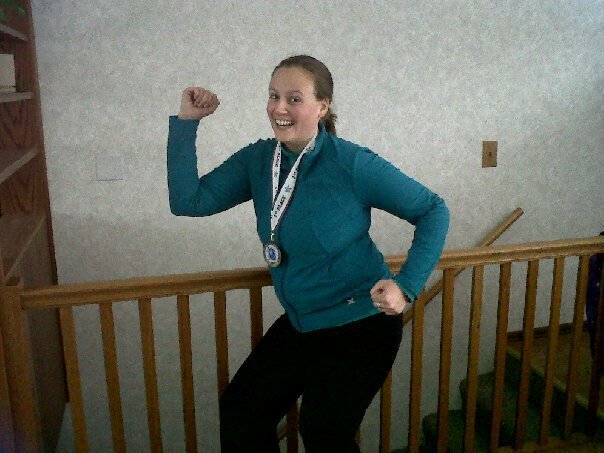 It all started in fall of 2009 when fellow MFPers suggested I try the Couch to 5k program. I thought, well, I’ll do it but if I hate it I’ll quit. Keep in mind I was someone who never, ever ran the mile in gym class at school. I “power-walked” it in 15 minutes, so didn’t see any reason whatso ever to work harder than that. I ended up finishing C25k, but didn’t follow the program religiously or on the time frame suggested. I did it here and there as I could talk myself into running. Winter months are hard here with the snow, cold and ice and the treadmill is dreadfully boring so I’d do it for a few weeks, give it up for a few weeks, pick up where I left off for a few weeks, etc. But, I realized I kind of liked running, which was weird to think let alone say out loud. Prior to last week, the last time I ran was probably early October but in the midst of making New Year’s goals, I decided I would do one physical (running) even each month for the entire year. That meant I had to find a January event! Only two weeks to train? Yikes! Then, I caught a cold and that put exercising out of my mind for a week. Shoot! Only a week to train? I can fit a few runs in on the treadmill and maybe one outside. Then, as it usually does, life happened. I ended up running one time on the treadmill five days prior to the 5k. Even then, I walked almost 1/3 of it. Going into the 5k, I told myself I wasn’t out to prove anything to anyone but myself. If I ended up walking 1/3 of it, that’s fine as long as I finished. That morning, I got there early and spent a lot of time debating over whether to wear a jacket, which hat to wear, etc. You should have seen me when they gave me my registration packet with a timing chip! “What do I do with this?” Luckily, I spied someone who had their strapped around their ankle with the velcro strip attached to the chip. Whew! Didn’t want to look like an amateur! It wasn’t long and I found a good pace and some good tunes to get me through it. I started passing the power-walkers, then the walkers who started out jogging, and soon I was passing other joggers. What? I’m passing people? No way! About 1.5 miles into the race, I hit another uphill portion that was covered in 2″ of slush, which made it feel like running in sand. Gotta love Minnesota winters! I ran as much as I could, even passing two more people, but had to give my legs a break. I walked maybe a 1/2 mile, then started jogging again. One of the women I passed whizzed past me but she had a great pace, so I fell in behind her and kept pace with her. Before I knew it, we were on the last mile, which was mostly downhill. Yes! As we passed the signs for 100 yds, 50 yds, 25 yds, etc., I kicked it into gear and started running faster and faster until I was sure my heart was going to explode or my legs would give way beneath me. The annoucer called my name and I crossed the finish line. I did it! I did it! After a brief conversation with the woman I followed, I walked back to my car with tears in my eyes. I was so proud of myself for doing something I never thought I could do. I did my stretches and wiped my tears before going to the awards tent. I figured, I should experience all of the 5k. Just as I was walking in the tent, I heard them call my name but given I have a terribly common name I figured they couldn’t possibly be calling my name. It had to be another Heather J. So, I watched as awards were given out, then snuck up to the announcer and asked. He then confirmed that he HAD called my name. I then received my medal for placing 3rd of 6 in my age bracket! Unbelievable! My official time was 40:09, which I thought was fantastic given I had never completed 3.1 miles on my treadmill in less than 42 minutes. I was told by my MFP friends that I would automatically run faster on race day, but never believed it to be true. As I crossed that finish line, all I could think about was how I couldn’t wait to tell my friends on MFP that I did it! I never would have started running, let alone have the courage to do a 5k had it not been for my wonderful, supportive friends here. Who would have believed that someone who started running at 200 lbs would run a 5k just over a year later? For those of you who encouraged me and supported me through this, I can tell you how much it means to me. For those of you who want to do a 5k but don’t think you can, I’m here to tell you that yes, you can!! You may have to work up to it, but I promise you it will be worth the time and effort. As for me, my next 5k is in two weeks. Runners aren’t joking when they say it can become addictive!